Twenty-year-old Skyler saw it from the window: a metallic object that descended from the sky at terrific speed, slowed above the Golden Gate Bridge, and then severed the bridge’s suspension cables before a toxic mushroom cloud lifted above San Francisco . . .
Flash-forward to a future America, where no one knows who was responsible for the explosion in San Francisco—or even what that explosion was, exactly—but Muslims have nonetheless been herded onto the old Indian reservations in the west. In suburban New York, Skyler’s little brother Dorian is twelve and dreaming about killing Muslims . . . when his next-door neighbor adopts a Muslim orphan from the territories. That simple act of benevolence will set off a series of increasingly terrifying incidents that force an entire community to reckon with their most deeply held beliefs, and—for Dorian—will lead to either tragedy or redemption. 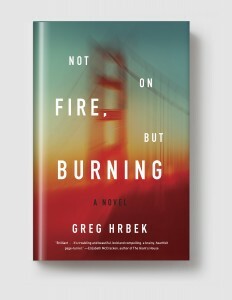 Greg Hrbek’s Not on Fire, but Burning is a brilliant, wholly original novel, and an absorbing adventure into the dark heart of a frighteningly familiar America. GREG HRBEK won the James Jones First Novel award for his book The Hindenburg Crashes Nightly. His short fiction has appeared in Harper’s Magazine and numerous literary journals, and in The Best American Short Stories anthology. He is writer in residence at Skidmore College.